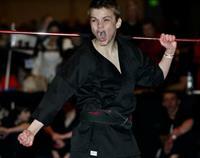 We are the Elk River area's premier full time Martial Arts School. Since we opened in March of 1995 we have helped thousands of area families and kids achieve a higher level of physical fitness, self esteem, practical self defense skills, and focus with our fun filled and challenging classes! We welcome all ages and abilities levels and will custom tailor our program to your needs!!! We are conveniently located just off of HWY 169 and School St across the street from Applebees. We are in the same mall as the Elk River Eye Clinic, Natures Best Dry Cleaning, and Snap Fitness.